Recording of the Aeolian Chamber Players' tenth anniversary concert at WBAI's Free Music Store on January 15th, 1972. The Aeolian Chamber Players specialize in contemporary classical music and have been the resident ensemble at Bowdoin College in Maine since 1964. The Aeolian Chamber Players consist of Lewis Kaplan, violinist; Erich Graf, flautist; Jerry Grossman, cello; Richard Wasley, clarinet; and Walter Ponce, piano. Part 1 of this recording features performances of Contra mortem et tempus by George Rochberg, Sonata no. 2 for violin and piano by Charles Ives, and Whisper moon by William Bolcom. During the intermission, Kaplan and Graf are interviewed by WBAI's Barbara Oka. 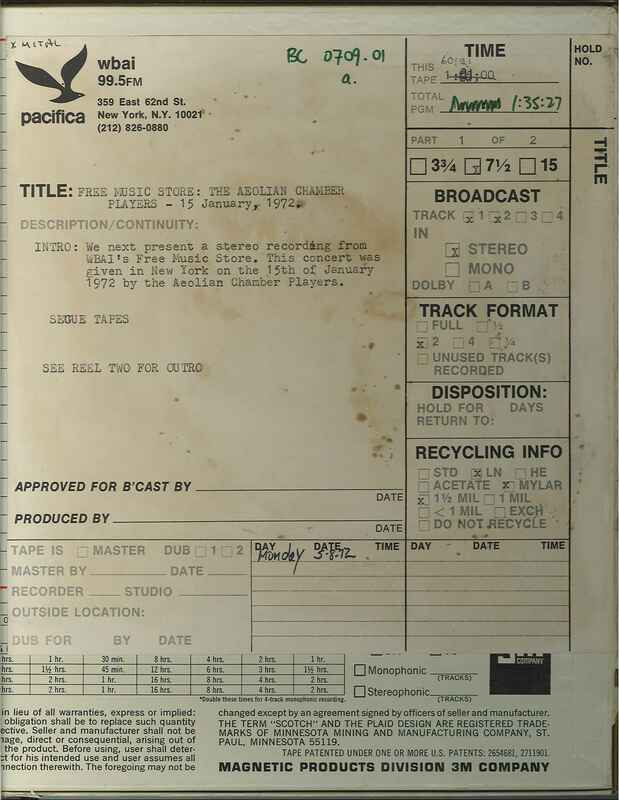 This recording was formerly cataloged as BC0709.01A. 2 reels (96 min.) : 7 1/2 ips, mono.